Capping off a week of attacks on the company, Sen. Orrin Hatch (R., Utah) called Thursday for an investigation into search giant Google's possibly anti-competitive practices. Hatch expressed concern in a letter to the Federal Trade Commission that Google was abusing its dominant market position by excluding competitors from its search advertisements. Google controls about 90 percent of global searches, a position it could potentially leverage to exclude would-be competitors from the market. Central to Hatch's criticisms are Google's data collection and privacy practices, which he claimed exacerbate the firm's potential to crowd out components. 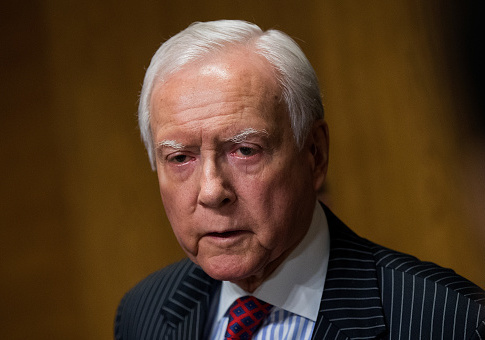 Several of Hatch's Senate colleagues, he noted, have previously expressed concern to Google over its data collection practices, including giving actual content of Gmail emails to third-party developers. A recent study found that even in the "incognito" mode of Google's popular Chrome browser, where users are assured of their privacy, data tends to leak out to third parties. This suggests that the firm has less of a handle on the enormous volume of data it collects than users might be led to believe. Hatch noted that in 2013 the FTC came very close to pursuing antitrust action against Google. FTC staff at the time wrote that it was a "close question" whether or not Google had formed an illegal monopoly by preferring its own "vertical content over that of rivals, while simultaneously demoting rival vertical websites." Reporting on the staff recommendation by the Wall Street Journal prompted two state Attorneys General to ask the FTC to consider anti-trust proceedings. Hatch's letter is just the latest challenge to Google this week. President Donald Trump took to Twitter to slam the firm for search results he claimed were "RIGGED" against him. "Google search results for ‘Trump News' shows only the viewing/reporting of Fake News Media," Trump wrote. "In other words, they have it RIGGED, for me & others, so that almost all stories & news is BAD. Fake CNN is prominent. Republican/Conservative & Fair Media is shut out." Trump also questioned whether or not Google's search practices were illegal. Economic adviser Larry Kudlow said subsequently that the White House was "taking a look" at whether or not search results could be regulated. Free speech and tech privacy advocates, including members of Congress, rejected the idea, arguing that it would run afoul of the First Amendment. However, this leaves the question of what, if anything, can be done to address increasing concerns about Google's largely unchecked power over Americans, both through how many use it and how much information the firm has. One concern raised by Trump is Google's left-leaning politics. The company had a close relationship with the Obama White House, a connection which continued through Hillary Clinton's abortive campaign for the presidency such that Executive Chairman Eric Schmidt wore a "staff" badge to Clinton's election-night party. This left tilt has extended to Google actually enforcing its political preferences by, as Hatch puts it, "remov[ing] from its platform legal businesses that the company apparently does not agree with." Hatch is likely referring to Google's choice to remove ads for bail-bond agencies, a popular target among advocates of criminal justice reform. The firm has also shown a willingness to bow to political pressures where necessary for profits; for example, considering censoring its results at the behest of the Chinese Communist Party. A willingness to enforce its ideological priorities on its platform is especially concerning given Google’s questionable privacy practices. Although ideology appears secondary to Hatch's anti-competitive concerns, the Senator made clear that he believes it is time for the FTC to totally revisit its consideration of Google. "There have also likely been other important changes to the market in the five years since the close of the FTC's [last] investigation, including the shift to mobile platforms," Hatch wrote. "In light of all of these changes, I respectfully request that the FTC consider the competitive effects of Google's conduct in search and digital advertising." This entry was posted in Issues and tagged Google, Orrin Hatch. Bookmark the permalink.